The Courtyard Anaheim Resort/Convention Center provides a contemporary backdrop for business and leisure travelers alike. Our hotel boasts an incomparable location, within walking distance of the front gates of world-famous Disneyland Park and just steps away from the Anaheim Convention Center. Each one of our spacious, thoughtfully designed hotel rooms and suites showcases free high-speed Wi-Fi access, comfortable bedding, a flat-screen TV, a mini-fridge, an ergonomic workspace and sleek marble bathrooms. Take advantage of our resort's stellar amenities, which include a cutting-edge fitness center, a heated outdoor pool and delicious on-site dining at The Bistro, our signature restaurant. And thanks to our hotel's terrific placement in the heart of Anaheim, you can enjoy stress-free travel to the family-friendly excitement of Disneyland Park, the UC Irvine Medical Center and many renowned attractions in the Orange County area. 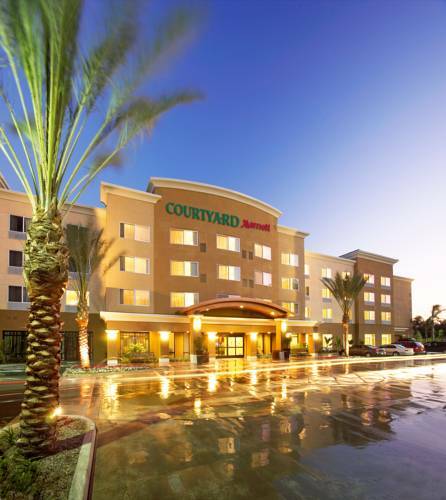 Discover modern excellence at the Courtyard Anaheim Resort/Convention Center. Stop by our on-site market before your daily adventure at Disneyland for snacks, desserts, on-the-go meal options and sundries. Visit us here in Anaheim at your convenience; we're open 24 hours a day. See Nixon's contingency speech in case the astronauts crashed on the moon. Board the helicopter he used to fly away from the presidency in disgrace. Also: the actual house in which he was born, and his grave, along with that of First Lady Pat Nixon. Another impressively huge doughnut on a building (there are two in Gardena). Someone must sort the olives, and you can be there to witness the complex culling process. Giant doughnut atop Randy's Donuts is seen again and again on TV and in movies.